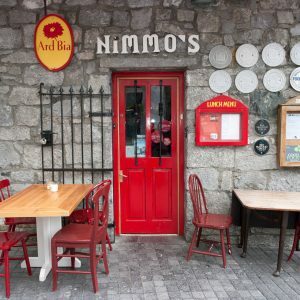 Near Spanish Arch Ard Bia is perfect pitstop for coffee, brunch (the pancakes are a legendary) or enjoying a well deserved lunch break whilst shopping in Galway city. The evening menu is even more enticing and menus regularly updated to reflect the season. Enter the unassuming exterior to the casual and comfy restaurant. All the staff are lovely and the vibe cool without trying too hard. In the heart of the city, Ard Bia is popular with locals and visitors alike, be sure to book your weekend dinner reservation in advance to avoid disappointment. Ideal for brunch, lunch or dinner in Galway city centre.